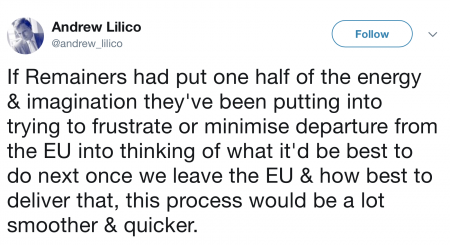 Economist Andrew Lilico isn’t at all impressed that people who don’t want to leave the European Union aren’t doing more to help Britain, er, leave the European Union. These 9 responses might not make Brexit any easier, but they certainly made our day better. It’s not as though people hadn’t seen it coming. People to blame for Brexit woes: 'Remainers'; the EU; Lily Allen; Merkel; the BBC. 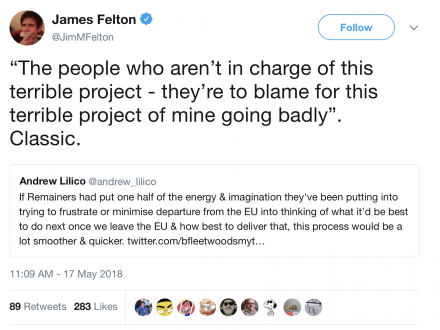 People NOT to blame for Brexit woes: 'Brexiteers'.